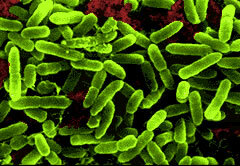 L. rhamnosus inhibits the growth of most harmful bacteria in the intestine. It is used as a natural preservative in yogurt and other dairy products to extend the shelf life. It also protects the urogenital tract by excreting biosurfactants to inhibit the adhesion of vaginal and urinary pathogens. Canaani, RB; Cirillo P, Terrin G, Cesarano L, Spagnuolo MI, De Vincenzo A, Albano F, Passariello A, De Marco G, Manguso F, Guarino A (2007). “Probiotics for treatment of accute diarrhoea in children: randomised clinical trial of five different preparations”. BMJ 335 (7615): 340. doi:10.1136/bmj.39272.581736.55. PMC 1949444. PMID 17690340. Retrieved 2009-12-03. Österlund, P; Ruotsalainen T, Korpela R, Saxelin M, Ollus A, Valta P, Kouri M, Elomaa I, Joensuu H (2007). “Lactobacillus supplementation for diarrhoea related to chemotherapy of colorectal cancer: a randomised study”. BR J Cancer 97 (8): 1028–34. doi:10.1038/sj.bjc.6603990. PMC 2360429. PMID 17895895. Retrieved 2009-12-03. Guandalini, S; Pensabene L, Zikri MA, Dias JA, Casali LG, Hoekstra H, Kolacek S, Massar K, Micetic-Turk D, Papadopoulou A, de Sousa JS, Sandhu B, Szajewska H, Weizman Z (2000). “Lactobacillus GG administered in oral rehydration solution to children with acute diarrhea: a multicenter European trial”. J Pediatr Gastroenterol Nutr 30 (1): 54–60. doi:10.1097/00005176-200001000-00018. PMID 10630440. Hojsak, I; Snovak N, Abdović S, Szajewska H, Mišak Z, Kolaček S (2009). “Lactobacillus GG in the prevention of gastrointestinal and respiratory tract infections in children who attend day care centers: A randomized, double-blind, placebo-controlled trial”. Clin. Nutr. 29 (3): 312–6. doi:10.1016/j.clnu.2009.09.008. PMID 19896252. Hatakka, K; Savilahti E, Pönkä A, Meurman JH, Poussa T, Näse L, Saxelin M, Korpela R (2001). “Effect of long term consumption of probiotic milk on infections in children attending day care centres: double blind, randomised trial”. BMJ 22 (7238): 1327. doi:10.1136/bmj.322.7298.1327. PMC 32161. PMID 11387176. Retrieved 2009-12-03.